Recently, Merchant’s Café has had some ghostly activity. It seems their lady of the night has been making her presence known to café guests, employees and visitors on the Spooked in Seattle Ghost Tour that ventures onto these haunted grounds. Some of the strange encounters have included slamming doors, moving objects, restroom faucets that appear to turn on and off without assistance, and the sighting of a full-on apparition. Constructed in 1890 and designed by W. E. Boone (a direct descendent of Daniel Boone), this café is one of the oldest operating restaurants at its original location in the Seattle area and possibly on the west coast. When it opened its doors as a saloon, they served five-cent beers to miners waiting to visit the upstairs brothel. Gone today are the five-cent drinks and the upstairs working ladies, but the good old café remains the city’s historic gem. Merchants holds onto its rustic, old world charm, with its newly installed Tiffany stained glass chandlers hanging from the original tin pressed ceiling, its exposed brick walls, and a rosewood bar that made its own personal journey through Cape Horn on a schooner in the 1880s. The rooms of the upstairs brothel are now private apartments, but visitors can continue their exploration of Merchants Café by visiting the underground bar. Tucked away under the sidewalk that was once lit by the purple glass of the old city skylights, sits a bar perfect for that time- forgotten feeling. One can only image what stories this place could tell if the walls could talk, and her story has yet to be told. The land upon which the building rests was once owned by Doc Maynard, who donated a large portion of land to Henry Yesler. Maynard did this to entice Yesler to build his famed steam- powered sawmill in Seattle. In 1857, Yesler then sold a small portion of this land to Charles Terry, famous for opening the first store on Alki Point in 1851. By 1864, a two-story clapboard structure settled on this site, with a shop on the first floor and a photographer’s studio on the second floor. 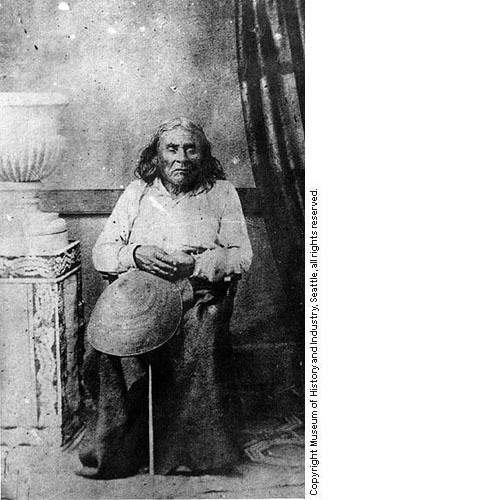 Here, Seattle’s first resident professional photographer, E.M. Sammis photographed the only known pictures of Doc Maynard and Chief Seattle. This two-story structure was destroyed by the Great Seattle Fire in 1889. John Hall Sanderson, then owner of the burnt remains, developed plans for building a brick terra cotta structure for a whopping fifteen thousand dollars. Intentions for this building were to house a wine and liquor shop on the ground floor with offices on the upper floors. This building eventually became Merchant’s Café, but was then known as the Sanderson Block. By 1892, the building had passed onto Charles Osner, who changed the building’s name to Merchants Exchange Saloon. 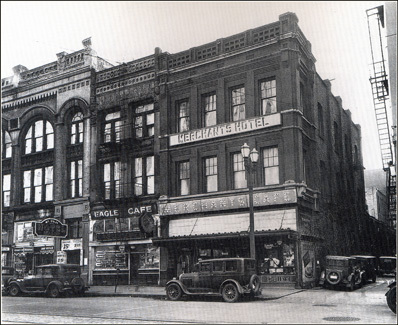 At this time, the building was operating as a restaurant, hotel, saloon, and a card room. Osner also offered other services for those young men taking a break from the hardships of lumbering in the greatly wooded northwest. 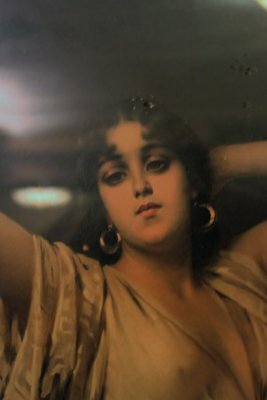 Prostitution was a very popular and lucrative past time for a male-dominate city, and Osner took advantage of this by offering a brothel on the third floor. Here men would find pictures of the lovely ladies aligning the saloon walls. If any gentleman requested their services, he would point at one of these pictures and then be directed to her upstairs room. In 1898, a year after the gold rush madness, Franz Xavier Schreiner purchased the Saloon. 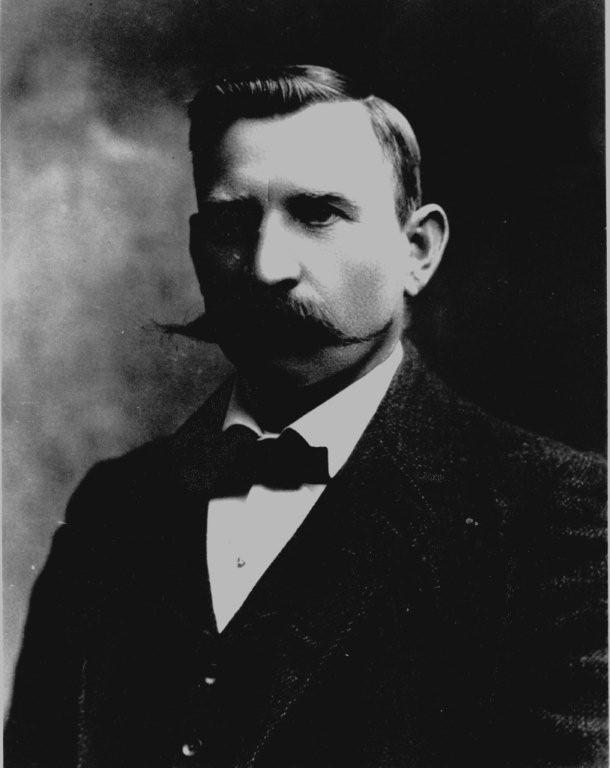 More popularly known as FX, Schreiner gained a small fortune in the Klondike as a supply salesman. FX then added a “Sunday Bank” in the basement where he exchanged cash for miners’ gold dust fresh from the Yukon. Then, he cashed in on the dust with Monday’s bank deposit, collecting as much as $100,000 worth. He continued this until 1910. In fact, the old safe that protected this gold still remains on the property upstairs behind the bar. FX continued his success by secretly paying off local police. By doing so, he continued to offer bootlegged alcohol and illegal gambling in the basement, as well as the pleasure services of a “high class” brothel in the upstairs hotel. In 1922, it seemed FX was ready for change, and so he sold his café to his son Carl and his nephew John Schreiner for $10 each. He then moved to Los Angeles for the weather and real estate opportunities. By 1926, the sale was completed by including the rest of the building to John who ran the business from 1923 to 1965. The building remained in the Schreiner family until the 1970s. Merchants Café was always famed as the saloon on skid row. By this time, the phrase had double meaning as Pioneer Square was thought of as the slums. The property passed through many hands and changed as the surrounding atmosphere grew to the historic district that it is today. Now in the hands of Darcy, the new owner has taken much pride in restoring the property and business to its natural beauty. Along with obtaining this historic building, she has inherited its ghosts. "oriental dancing girl" by Nathaldi Siehel. On the far back wall hangs the haunted painting known as “oriental dancing girl” by Nathaldi Siehel. This painting strangely revealed its ghostly past to the new owners while being photographed. Another tale that is told among the employees is that of a little girl and boy that haunt the basement of Merchants. A fire in 1938 struck Merchants and took these young lives. Here, many encounter sights of small shadowy figures lurking about and play games on the staff. It seems one of the most active areas is the downstairs restrooms. Here, many have reported seeing the apparition of a woman, doors opening and closing, and a woman’s whispering voice into gentlemen’s ears. But the ghost stories and experiences continue on, up to the top floor. In one case, a woman was harassed by a male, ghostly predator. But most recent encounters include the mysterious lady of Merchants Café. Some would like to know who this feminine ghostly figure is. Was she one of the working girls featured upstairs? Or is she just someone who hung around the café in the prime of her life? As she continues to pop in and out among the living, witnesses will constantly question their sanity and even her motives. Maybe she is curious about the recent new owners and the positive changes they have made to her haunting environment. Merchants Café with a real ghost hunter on the Spooked In Seattle Ghost Tours.